The bugs already know it. Bright lights are a blast. And at Vivid, “the world’s largest festival of light, music and ideas”, things are looking as bright as ever for 2018’s 10th anniversary. 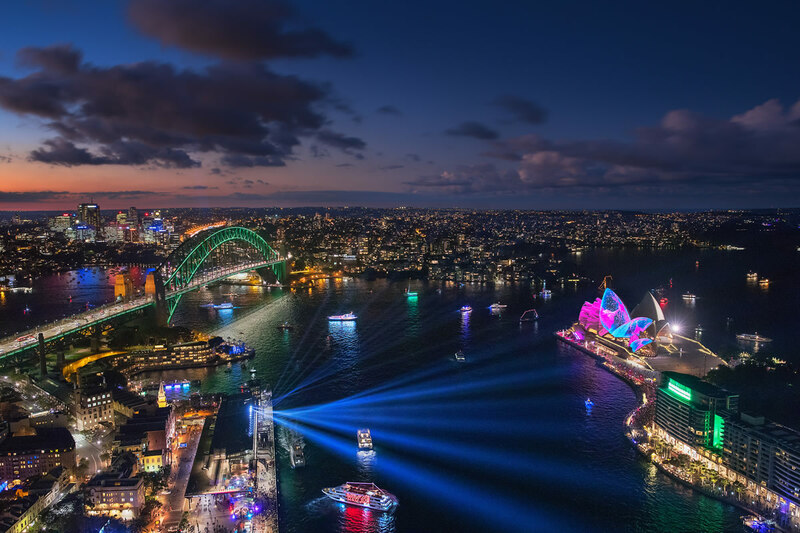 Millions of wide-eyed people will visit across 23 nights to see some of Sydney’s most iconic buildings and monuments beam with the kind of light that needs be seen to be truly fathomed. There will also be a bumper bill of award-winning domestic and international musical acts and there will be big conversations about big ideas. Song Hotel Sydney, which has recently added brand new premium rooms at killer prices, is the perfect place to stay to switch on your festive spirits. You might not be able to absorb all of Vivid during your time in Sydney but here are four experiences we think are well worth your while. Neil Finn, Iron and Wine and St Vincent are some of the main musical acts at this year’s Festival but it’s pretty hard to go past Dreams, the collaboration between Daniel Johns (ex-teenage angst merchant of Silverchair) and indie pop/electro oddball Luke Steele (The Sleepy Jackson and Empire of the Sun). Both are as notable for their sabbaticals as they are for their reappearances these days but their imminent return to Sydney’s limelight screams big event. Dreams’ show at the Sydney Opera House is the only Australian show of their forthcoming mini-tour and it will showcase their debut psych-electro album No One Defeats Us, reportedly 15 years in the making. The hand-raising dance-pop anthems they have in store is the perfect fit for a Vivid party. 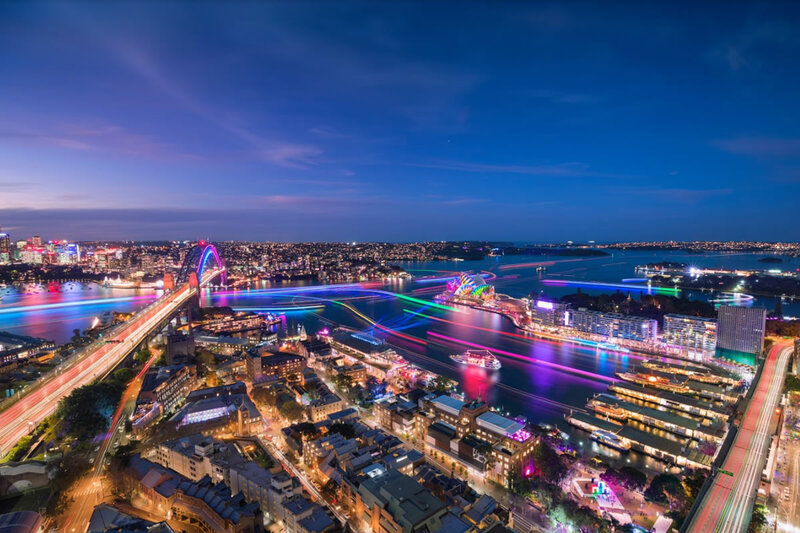 A cavalcade of water vessels tricked with LED arsenals is going to transform Sydney Harbour’s water into a kaleidoscopic light show throughout Vivid. Captain Cook Cruises, a cruise company running many nightly jaunts from Darling Harbour King Street Wharf No. 1, gives you a great vantage point to ogle the laser displays dancing off the harbour. You can stretch your time on the water with a range of tiered dinner and drinks packages too. Ideas. We all have them but some are much better than others. At Vivid, however, all the ideas are gold-standard and there is a shedload of them. Vivid plays host to discussion panels, Q&A events and presentations featuring some of the sharpest heads you could hope to listen to. 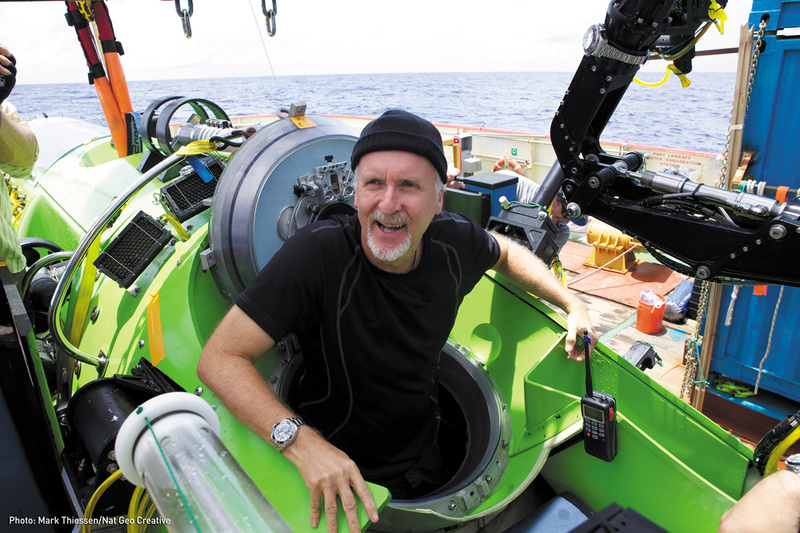 Whether it’s Dare Jennings, founder of Mambo, Phantom Records and Deus Ex Machina talking about his origin story and success, Julia Zemiro helming the inaugural Mark Colvin Conversations (about whether schools and society are fostering or stifling imagination) or film-making giant James Cameron discussing his affinity with exploration and conservation, Vivid’s ideas exchange will light you up. Light Market producer Victoria Harbutt, Sydney-based scaffold sculpture artist Alejandro Rolandi and a gaggle of volunteers have pulled together to help reimagine parts of Chatswood Mall as a homage to the shanties of Brazil and Star Wars. A visit to Light Market is a surefire way to stoke your senses. 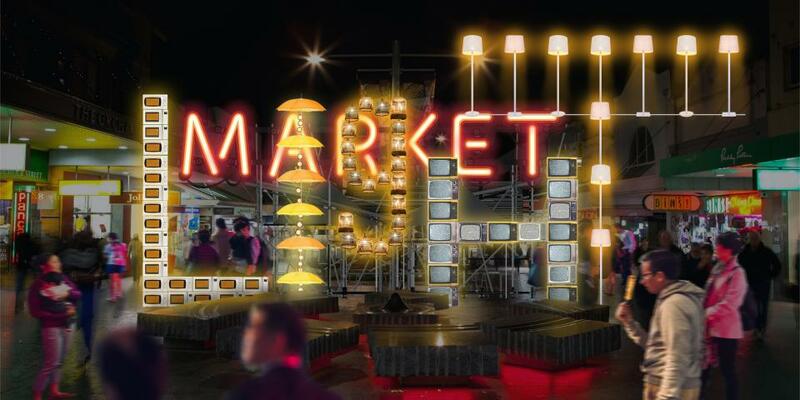 Market stalls made out of months of Chatswood recycling smoke with exotic menus. Cosmic light displays mix with interactive installations and the pulse of festive music makes this spot one of the liveliest places to visit in Chatswood.